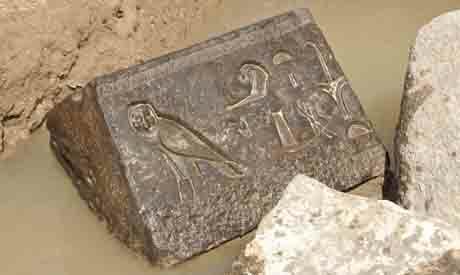 A German-Egyptian archaeological mission has discovered the lower part of an over-two-millenia-old basalt chapel in Cairo's suburb of Matariya. Found on the archeological site of the Heliopolis temple, the chapel is believed to have built while Ancient Egyptian king Nectanebu I ruled over Egypt from 380 to 362 BC. Egypt's minister of antiquities Mamdouh Eldamaty explained that the chapel is made up of several basalt blocks engraved with hieroglyphic text. “It's a very important discovery,” the minister said, explaining that it is the first time that a chapel has been found within the temple’s walls. A team is now working to reduce the level of underground water in the area so as to continue excavations to reveal more of the temple’s secrets, he said. The archeological team also unearthed a royal statue featuring the cartouche of king Merneptah, who ruled centuries earlier from 1213 to 1203 BC, said Ayman Ashmawi, Egyptian co-director of the mission. Detrich Rau, German co-director of the mission, added that his team hoped to uncover the rest of the chapel during the next archaeological season, to start in September.